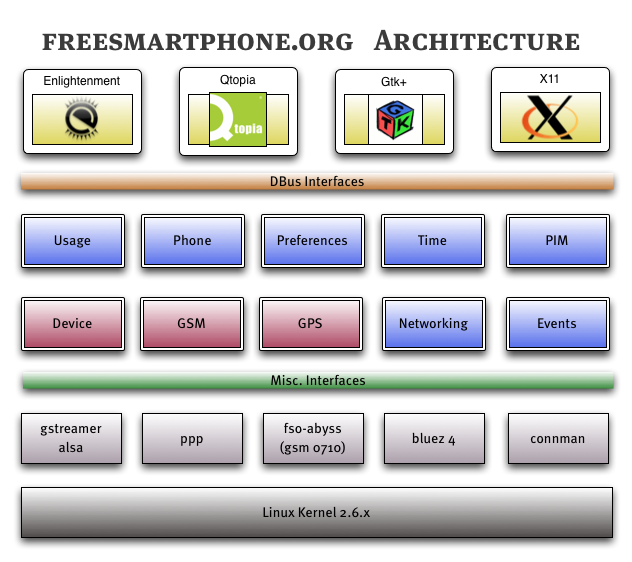 FSO (freesmartphone.org) is a project to create a standardized service layer (middleware) for Linux-based phones. It was funded by Openmoko Inc. from January 2008 until March 2009. Focus is on stable highlevel services that you can access from whatever language or UI that supports dbus. The FSO middleware has been integrated into most of the current distributions including SHR, Om 2009, neovento, Debian and Gentoo. At the moment FSO only works on the Openmoko phones. There is work in progress for bringing it to the Palm Pre and several HTC devices. For more information see http://www.freesmartphone.org, http://docs.freesmartphone.org, and http://trac.freesmartphone.org. See Building_FSO for more information. The feeds are now at http://downloads.freesmartphone.org. cli-framework -- a python dbus command line interface. mickeyterm -- a MUXer-aware minimal terminal emulator. Read our documented frameworkd.conf configuration file to learn about the other options. Attach the logs to the tickets, please. Where we write new code, we will use Python to implement the dbus services. The reason for that being the rapid prototyping nature of Python and the emphasis on the D-Bus APIs. Using Python, the turnaround times to experiment with APIs are incredibly faster than for using a compiled language such as C or C++. Once the APIs have been used by application programmers, we can start profiling and possibly reimplement some of the services with daemons written in Vala, if necessary. We might as well succeed in improving performance by using Pyrex/Cython/Ctypes to keep the benefits of Python. Michael 'Mickey' Lauer (team leader) -- Openmoko freelancer, working in Frankfurt/Main, Germany. Jan 'Shoragan' Luebbe -- Openmoko student, working part-time in Brunswick, Germany. Daniel 'Alphaone' Willmann -- Openmoko student, working part-time in Brunswick, Germany. Stefan Schmidt -- Openmoko student, working part-time in Brunswick, Germany. This page was last modified on 25 August 2011, at 07:58. This page has been accessed 85,357 times.